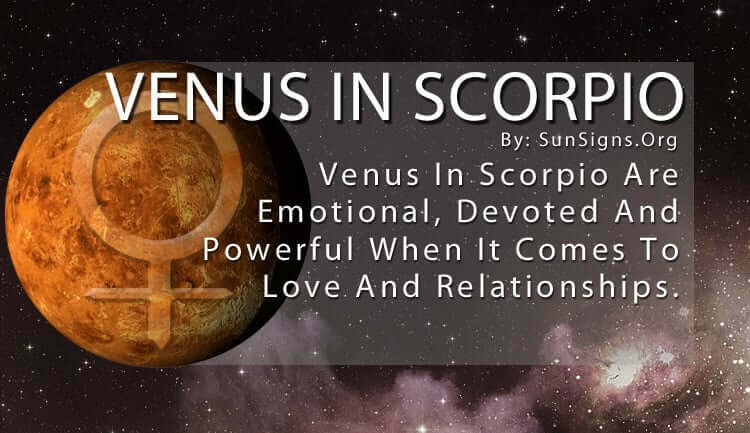 If intense is the word that best describes Scorpio, then Venus in Scorpio is downright powerful when it comes to love and relationships. Their emotions run deep and their devotion even deeper. And while they don’t reveal too much about themselves, their mystique only makes them more attractive to others. Venus is symbolic of love, sensuality, relationships, finance, money, income, beauty and the value we place on objects. For Venus in Scorpio, love is a serious business and they pay close attention to their loved ones. They are incapable of beating around the bush, which some people appreciate while others find it a bit disconcerting. Being a water sign, Scorpio also deals with a myriad of emotions that others can only imagine. This means Venus in Scorpio feels love up to its highest degree, and they only know how to love others in that way. Venus in Scorpio is incredibly intuitive and can read anyone like a book, allowing them to give their partner the utmost pleasure. Here is where they unleash every ounce of emotion in their body to wash over their mate. And if they aren’t ready for such a provocative experience they may drown in the sea of love that Venus in Scorpio has to offer. But for those who know how to swim down into the depths of their soul, it is a rich and fulfilling experience. If their lover doesn’t mind going to extremes then it is a satisfying tryst for both people involved. The only way to keep Venus in Scorpio happy is to devote your entire self to them, because that is what they do for a committed relationship. They know no other way to relate to people – there is no halfway with them. And if those closest to them aren’t willing to put in the same amount of effort, Venus in Scorpio will drop them completely from their social network. It only takes one small slight to upset the scorpion, and that’s when you will feel the sting of their tail. It’s important to maintain loyalty with them at all times or else they will forget (and not forgive) you. This may involve allowing them to control you so they can feel they have total possession over you, but don’t give up everything completely. Simply allow them the illusion to offer them the security and stability they need. But they are also fiercely loyal and would go to the ends of the Earth to protect those they love. Their close ties may be too close for some, who feel Venus in Scorpio can be quite possessive of them. But others find this kind of obsession intoxicating and can’t get enough of them. It takes a strong personality to keep up with their intensity. The Scorpio Venus person still wants a lover who is as strong and fierce as they are – they’re just afraid of something bad happening. But if you can reassure them of your loyalty, you will get nothing but complete devotion in return.